Inspired by travel to Vancouver, British Columbia. Mountains, rocks, canyons and botanical gardens, endless inspiration for fresh bakes. 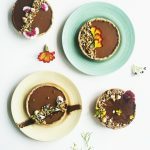 These wholemeal spelt tart crusts are filled with maple sweet chocolate custard, topped with crunchy buckwheat rubble and cocoa dust. Deceptively dairy free and entirely plant based, they perfectly reflect the trip...wholesome, fill you up in all the right ways, their end a little bittersweet.